The details of that day are powerful and entertaining for sure, but that’s not why I’m writing this post. You can follow the link MLB.com to learn more about the details of the day. As Derek Jeter’s hall of fame career comes to a close this season, I think it’s worth taking a closer look at the less than a minute long interaction he had with my family on that fateful day. In only a few seconds the Captain communicated four powerful traits that I believe have made him such a phenomenal leader of the New York Yankees organization. As we waited for Dad to throw out the pitch behind home plate Yankee legend Reggie Jackson approached my father. He took a knee next to Dad and asked him about the Pace University ring he had on his finger. My brother, Mother, and I were standing behind Dad in awe. A few moments past and I heard my brother say, “Holy sh*t, it’s the captain.” I turned to my right and saw Derek Jeter stride from the dugout to a wave of applause. When Jeter shook Dad’s hand he addressed him as “Sir” and said it was an honor to meet him. He’s never met my father before. He had no idea who we are, but he still addressed my father as “Sir.” Reverence for those you encounter no matter who they are. That’s what makes a great leader. 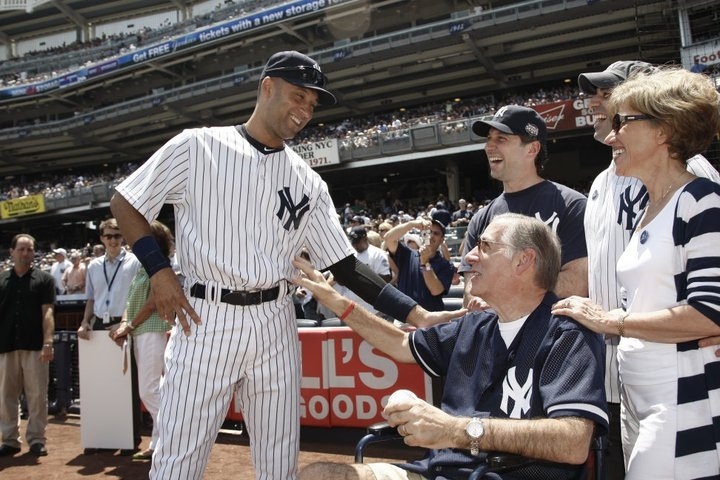 Instead of being star struck, from his wheelchair my father poked Jeter in the side. He told the captain how he had been at Fenway Park to witness Carl Yastrzemski’s 3,000th career hit in 1979. Saying, “if you hit your 3000th today that would make you the 2nd big leaguer I’ve witnessed hitting their 3000th in person.” We were all a little shocked that my father said this. And my brother just goes, ‘No pressure,’ and we all laughed – including Jeter. He could have gotten flustered. He could have walked away in a huff. It was a big day – lots of pressure. The press was awaiting this 3,000th. Derek was even being shadowed that day by cameras from HBO who were shooting a documentary about his “Road to 3,000.” Instead of a tense reaction, he kept it light. There is no question that Jeter is a hugely talented ballplayer. However, I believe what has made him great, and what has guaranteed him to be a Hall of Famer has been his skill. His undying dedication to preparation to cultivate that skill is what has made him great. His willingness to work harder than the guy next to him. His vision and character that has made him a success. The 1,000’s of hours in the training room. When Derek stepped into the batter’s box that day. He stepped into the record books in grand fashion by making his 3,000 hit a homerun. Not because he had to dig deep that day. It was because he honed his talent through hard work and dedication. So when the big moment presented itself as it had so many other times in his career he could rely on his skill set. Witnessing it was a thing of beauty. I consider myself fortunate to have had this short interaction with the Yankee captain. As a Yankee fan, I’ll miss him, but I’ll also learn from his example. I’m certain that we can all expect great things from Derek in the future as well. The man is a true leader, a class act, and someone we can all look to for inspiration in our lives and businesses. I tip my hat to #2. Like this post? Follow me here for notifications when I post new content. Contact me here to hire me to speak at your next event. Visit Silverback Social to gain access to our digital marketing vault. Once registered receive e-books, PDF’s, cheat-sheet, tutorials, and more. Remembering Sean Lugano on September 11th To All the Ice Bucket Copycats: Please stop.